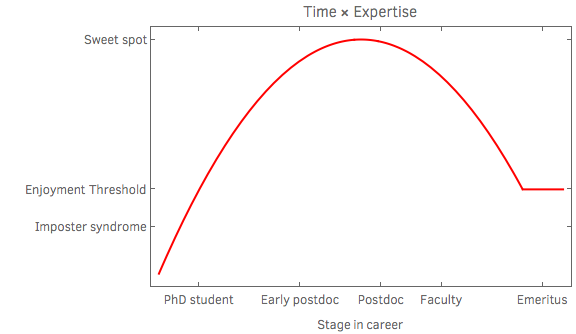 From which it may be clear that sadly, as you gain more expertise, you start to lose time. 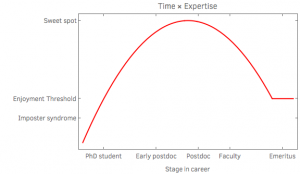 That is why many faculty members still fondly remember their postdoctoral career – when they could focus on research (almost) full-time. It also means that seniors work well with their juniors, trading expertise for working hours. But while this is the case, the relationship is not completely symbiotic. A supervisor will probably survive a less successful collaboration, but the odds are against a junior. That is why most physicists I have met (including myself), continue to have a special kind of reverence for their advisors and mentors. They realize that they owe their careers – besides to their own drive and grit – to the continued support of their scientific parents. In a field where progress is almost completely determined by human capital, encouraging a new generation of talent is of the greatest importance. That may seem obvious, but is easy to forget during day-to-day activity in the very competitive, perpetually changing environment that is theoretical physics. So, as I am about to embark on my first experiences as a (co-)supervisor, I tell myself to remember this: being a friendly, patient, and supportive mentor may be my greatest contribution to science.